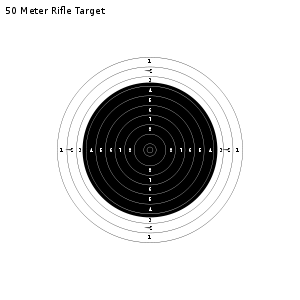 Competitors shoot at a stationary target consisting of ten concentric rings, with the innermost being the ‘inner ten’ with a diameter of 5 mm. The targets are placed 50m away and shooters fire from the Kneeling , prone (lying down) and Standing positions in that order. Correcting lenses and telescopes must not be attached to the rifle. Typically the 3-P rifle discipline is very similar to the "match" rifle discipline. It is a .22 calibre rim-fire, highly specialized, precision target rifle. During the "standing" course of fire the rifle is held and fired unsupported by any sling or other means (as in the photo above). However, between shots the rifle can be rested and reloaded on a stand. During the kneeling and prone phases of 3-P shooting, the rifle may be supported by one arm and a sling. Like match rifle the only allowable sights are "iron" sights meaning no telescopic sights are allowed, and no "optics" may be attached to the rifle sights that magnify or enhance the target or target image. The maximum allowable weight of the 3-P rifle (with all attachments) is 8.0 Kg (17.64 lbs) for men and 6.5 kg (14.33 lbs) for women. 3-position rifle competitors will typically wear a heavy canvas or leather jacket to provide support to the upper body in order to hold the rifle unsupported (except for the rifle sling). Specialized leather and canvas trousers and shoes may also be worn for additional support in the standing and kneeling phase. The prone portion of 3-P rifle is practically identical to prone match rifle, but the shooter may wear their boots and trousers. During kneeling and prone portions the sling is attached to the fore end of the rifle stock and then to the supporting arm. Kneeling rolls may be used for kneeling support, and shooters will lay on a mat to provide comfort and adherence for the elbows during prone shooting. Spotting scopes on their own stands are used for the shooter to "spot" his or her shots on the targets at 50 meters. 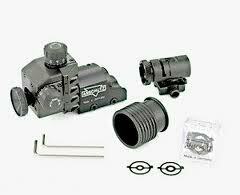 If electronic target systems are used, then a small monitor is provided in lieu of the spotting scope. The 50 metre 3-P match rifle event is fired in accordance with International Sport Shooting Federation (ISSF) rules and regulations. The course of fire for 3-P is: kneeling, prone, and then standing. 3: Then finally the standing position (40 shots men, 20 shots women). For the men’s 3×40 event, the shooter fires 40 shots each in the prone (lying down), standing and kneeling positions at a target set 50m away, giving a maximum score of 1200. The best eight shooters from this opening program qualify for the final, which consists of ten further shots, each fired on command. Each shot is evaluated in decimal tenths (10.9 being the maximum). The decimal score gives a maximum "Final" score of 109. The “Final” Score is added to the score from the opening program, giving a Overall maximum score of 1309. The Total time-limit allowed is 2 hours and 45 minutes if using electronic targets, or 3 hours and 15 minutes if using paper targets. Before the match starts, there is a 15 minute preparation period, where the shooter can set their equipment up, shoulder their rifle and dry fire if required. There then follows a 15 minute combined sighting and preparation period prior to the start of the match, where you can fire unlimited sighting shots and make any equipment adjustments that are required. 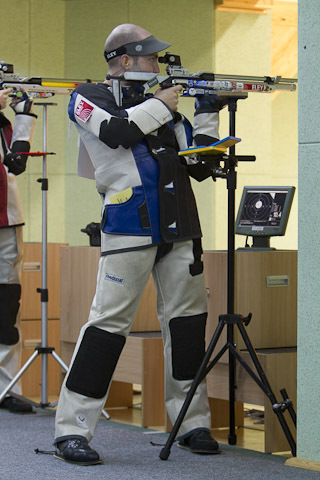 For the women’s 3×20 event, the shooter fires 20 shots each in the kneeling, prone (lying down) and standing positions at a target set 50m away, giving a maximum score of 600. The best eight shooters from this opening program qualify for the final, which consists of ten further shots, each fired on command. Each shot is evaluated in decimal tenths (10.9 being the maximum). The decimal score gives a maximum "Final" score of 109. The “Final” Score is added to the score from the opening program, giving a Overall maximum score of 709. The Total time-limit allowed is 1 hours and 45 minutes if using electronic targets, or 2 hours if using paper targets. Before the match starts, there is a 15 minute preparation period, where the shooter can set their equipment up, shoulder their rifle and dry fire if required. There then follows a 15 minute combined sighting and preparation period prior to the start of the match, where you can fire unlimited sighting shots and make any equipment adjustments that are required. The standard ISSF smallbore 50 meter target measures 15.5cms in diameter. The "10" ring is 1cm (10 mm) in diameter with an inner "X" ring that is a mere 5mm in diameter. 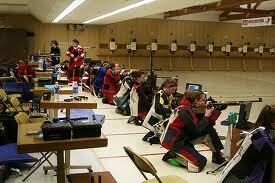 Specific rules that govern the equipment for 3-P rifle can be found in chapter 7 of the ISSF rule book.